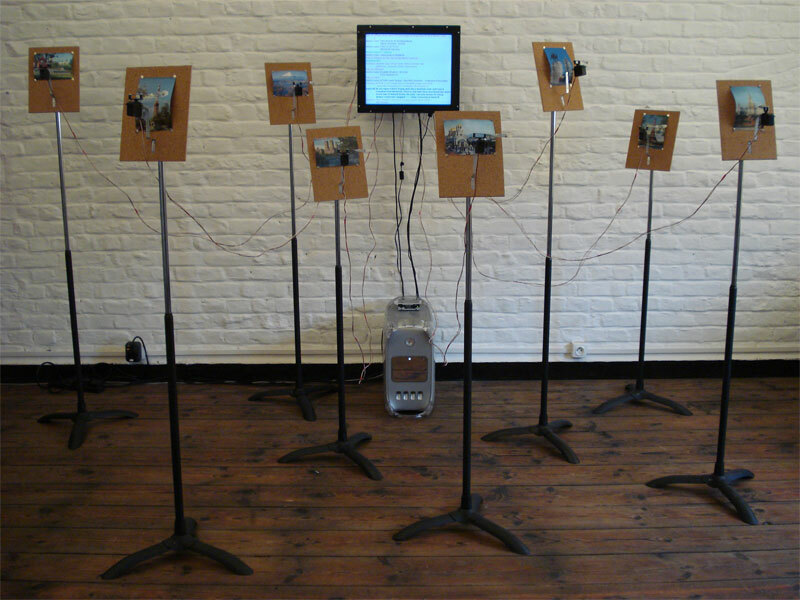 The user messages of a live Internet chat room are transcribed, in real-time, into physical space by electromechanical fingers (digits). 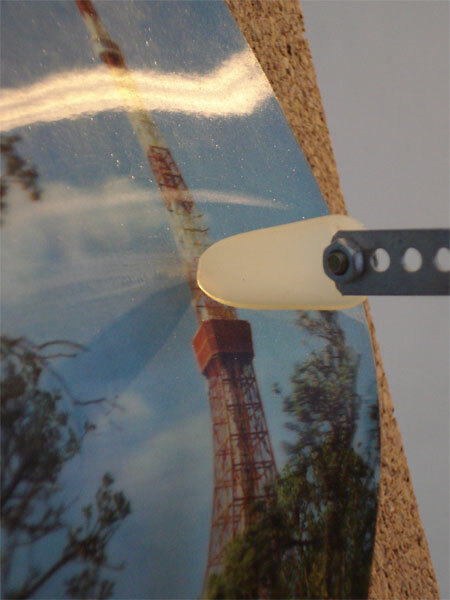 The fingers are fixed in front of lenticular postcards, mounted either on stands or directly on the wall. 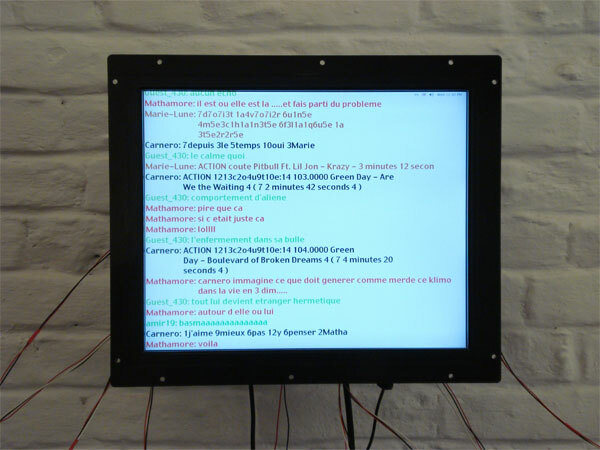 The messages of the chat room users are displayed on a screen and converted, letter-by-letter, into different positions of the fingers. In this way, they rapidly move to the left and right in various intervals and, with their nails, scratch the textured surface of the postcards, producing a melody of their own language. "McLuhan saw modern technologies as extensions of man. We should see them, rather, as expulsions of man" says Jean Baudrillard in The perfect crime. We noticed that it can be difficult to retain an anchor (in "physical reality") during a connection to a chat-room; being expulsed, it is not certain that this possibility to withdraw to the fortification of the self still exists. Once being swallowed up by the screen, is there still a return journey? Considering the communicators on the internet as autonomous entities on the other side of the screen we propose to implant a second generation of prosthesis, not McLuhan's "extensions of man" by technology, but extensions to the virtual, to force Baudrillard's "expelled" to take a body. By taking back to reality the virtual communication without ignoring its underlying nature of binary data code, we want to be faithful to a concrete understanding of digital information, and to listen, as a new language, to the translation of pure electric impulses. And so, the chatter is piling up on the impalpable cybernetic network. Exchange, discussion, conversation? We’ve called it communication and that’s what we’ll stick to. In this ghostly corpus of digital communication scratchy nails incarnate and exogenous fingers are pushing deep inside. These virtuous interpreters of the virtual become the new Champollions working on the sonic transposition of those silent data. Transmutations of the intelligible into primitive electric impulses. From impulses to convulsions, males are responding to females, birds are courting. Funded by la DRAC Nord-Pas de Calais (F).